Between 1949 and 1984, Artist Joseph Havens worked as an art director for department stores, advertising agencies and commercial printers in New York, Washington D.C., and Massachusetts. He enjoyed a developing avocation as a painter in oils and watercolor. He participated in many shows of the Wellesley Society of Artists, the North Shore Arts Association of Gloucester, Mass., and The Copley Society of Boston. His paintings have been exhibited in juried shows of The American Watercolor Society, Watercolor USA, The New England Watercolor Society and the State Department’s “American Painters in Paris” show in 1973. His art education included studies in drawing and in art history at Princeton, a year at the New York School of Fine and Applied Art, drawing at The Art Students League, The Workshop School, the Famous Artist’s Course in illustration and workshops with Carl Schmalz. His experience as a fine artist has included approximately 75 portrait studies of fellow soldiers during his five years as an Infantry soldier and officer during World War II (1941 —1946) and 35 years in advertising art. He served as an art director for Batten-Barton-Durstine and Osborn, Kenyon & Eckhardt, Davis Advertising and Commonwealth Press. He did design and illustration for a great number of well-known banks, insurance companies and manufacturing companies in all sorts of print media. 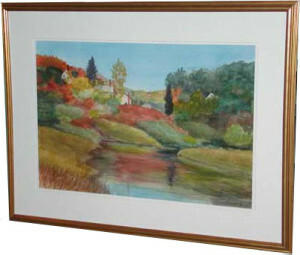 Havens’s post-retirement trips to England, France, Italy, western USA, Florida and Bermuda provided inspiration for many paintings. He sold or donated more than390 paintings at the latest count. Joseph’s principal focus has been coastal Maine. For over 30 years his paintings have been on display at the Wright Gallery and he has been a member of the Art Guild of the Kennebunks. *Taken from the York County Coast Star, 9/29/2011, the last line was updated. Joseph B. Havens, 97, of Kennebunk, passed away November 23, 2015, he will be dearly missed by friends, colleagues and family. There are still a few paintings available.